Dexter and Daphna Wax don’t quite fit in, even with each other. She loves reading, and he loathes it, but neither is pleased by their “special” thirteenth birthday gift, a ruined old book full of nonsense. But the moment it enters Daphna and Dexter’s lives, bizarre things begin to happen. Why is their father, who found the book, suddenly so distant? Is the old man who took it from him some kind of hypnotist? Why is a giant, red-eyed boy menacing them? Now Dex and Daphna have to work together to stop the old man from ruining their lives. But as they unravel the secrets of the Book of Nonsense, they will discover the truth about their own extraordinary destiny. Hear David describe the origin of the book and read an excerpt at TeachingBooks! 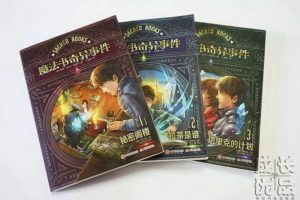 Check out the Chinese editions (released as The Sacred Books Series)! If your kids have already ripped through the Harry Potter series, The Golden Compass, and The Spiderwick Chronicles, then spending some time with…The Book of Nonsense is most definitely a good idea. David Michael Slater, a prolific Portland-area author and middle school teacher, is known for his picture books. Now he’s produced a middle-grade novel called The Book of Nonsense, the first in a planned series. The book is set in an alternate version of Southwest Portland, where giant red-eyed boys lurk in the woods and there is a huge bookstore called the Antiquarian Book Center filled only with books about magic. The story opens when twins Daphna and Dex — who can’t stand each other — are about to turn 13. Their father is a book scout, and the day before their birthday he returns from a book-buying trip to Turkey with an ancient, damaged book that appears to be full of a nonsensical jumble of words. Daphna urges her father to sell it to the book center. But she is shocked when her father hands over the book for no money at all — and agrees that Daphna will begin to work for the store’s owner, Mr. Rash. Has her father been hypnotize d? What is the secret of the book? And what really happened when Daphna and Dex’s mother died? Even more secrets are revealed, including ones the twins have kept from each other. What would you get if you combined Indiana Jones, Harry Potter and Sherlock Holmes?…If you were David Michael Slater, you’d get the 13-year-old Wax twins, Dexter and Daphna…the intrepid stars of David’s…adventure series…These books…are starting to make waves. David Michael Slater just completed a new literary fantasy adventure series fraught with suspense, hidden clues, bizarre twists and an ancient book full of utter nonsense…Slater understands that the secret to capturing the interest of teens is to engage their curiosity and intelligence by hooking them with a blend of unusual references, mysterious clues and a dark, suspenseful plot packed with action. The Book of Nonsense is a keen and knowing adventure that, in the best ways, belies its title. It is permeated by a sense of wonder, a sense of mystery, and a dead-on sense of what it’s like to be a rising teenager beset with rights and privileges of family and brains and curiosity, and the afflictions of the same. David Michael Slater weaves a crafty plot that has appeal for at least three generations of readers (from grandparents down), and never condescends to any of them. When a rare bookstore opens in town, Daphna and Dexter are intrigued by the cryptic volumes within. But the mysterious store owner, Asterius Rash, is only interested in one particular book – a book so rare it involves magic just to possess it. Daphna and Dexter come under Mr. Rash’s spell, and in an effort to break loose, they delve into a world of the past – uncovering family secrets, and the true meaning of The Book of Nonsense. 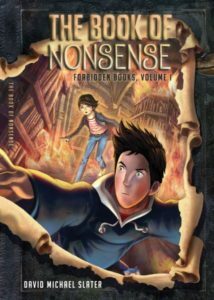 With more twists than a roller coaster, The Book of Nonsense will keep you continuously involved and turning the pages. It’s perfect for both fantasy and mystery readers. Words have power! Every writer and reader knows this and that is why they surround themselves with words. Daphna and Dexter are twelve-year-old twins. On the eve of their thirteenth birthday, all heck breaks loose. Daphna has found an interesting bookstore the summer that her father has been gone looking for rare books. Their mother is dead. When she brings her father to that bookshop strange things start to happen. The owner, a wizened old blind man, has affected her father, and her father has promised the owner that Daphna will work for him starting the next day, her birthday. Dexter, who doesn’t like his sister, follows Daphna to the bookshop and figures out that the old man is hypnotizing her. Daphna and Dexter then have to figure out together the mystery and save both of their lives. I enjoyed this story and will be waiting to read the next one. Daphna and Dexter are well-written and easy to root for. I really enjoyed the fact that the author has written about dyslexia. My oldest daughter has light dyslexia, which is how the author described Dexter’s condition. Words move on the page and fall off. Many people are ignorant about this disorder. They believe that if you are dyslexic then you only see letters and numbers backwards. My daughter’s dyslexia is hard to treat, and even though she wears glasses that seem to keep the letters on the page, she has had a hard time catching up with her peers because of very ignorant teachers and administrators. So thank you, Mr. Slater, for bringing that disorder to the surface. I will definitely be looking forward to the next installment of the SACRED BOOKS series. Slater’s new release, The Book of Nonsense, is anything but; twelve year old twins Daphna and Dex, so different in so many ways, work to solve a word problem in the mirky worlds of book dealers and geriatrics. Seeking clues to the meaning of the arcane First Tongue the two cross paths with alchemy, archeaology, and astrology and end up wiser and more sensitive to the deep bond that is curse or salvation to twins. This mystery, with its worlds of dusty book shops and musty nursing homes, is peopled by sages, pedantics, epic heroes, and a plethera of archvillans.